We have received somewhere between 5-6 inches of rain in the last four days. That, coupled with the deep snow pack and the still frozen ground has lead to some flooding. 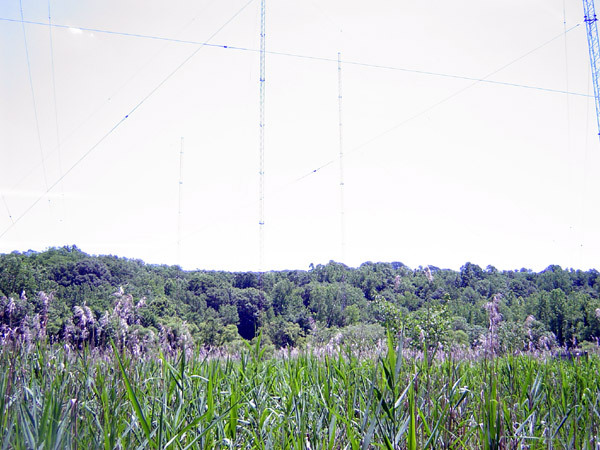 The WLNA antenna array is located along the Peekskill Hollow Creek in northern Westchester County, NY. 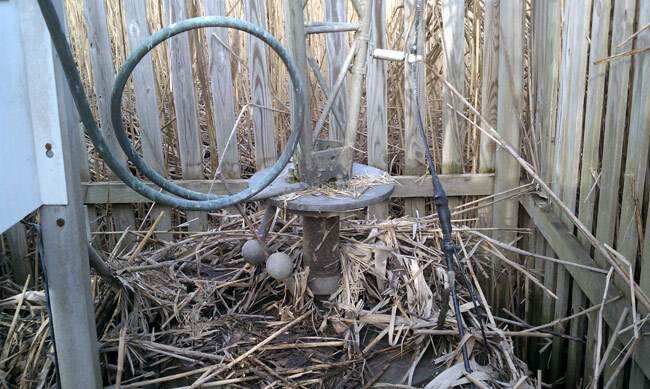 Back in 1980, it might have seemed like a good idea to locate an AM station in a tidal swamp along the Hudson river. I am sure the land was not that expensive and from an engineering standpoint, having a continually wet, partially brackish ground system may have seemed like a slam dunk. Unfortunately, the idea never really panned out in application. First of all, the neighbors had other ideas, fighting the radio station owners all the way to the NY State Supreme court. Secondly, technically, it never lived up to expectations. The original non-directional antenna on 1430 was a 1/2 wave tower which by all accounts, worked very well. It did not, however, allow for night time service, which is why the new sight and array was sought. By the time the system was built, AM was already in steep decline and I doubt the owners ever recouped their investment. Fast forward to today. All five base insulators are under water and the transmitter is off the air. These are pictures from last Wednesday after the first flood waters receded from the Monday/Tuesday storm. I imagine it looks worse this morning, although I don’t own a boat and won’t be wading out there to look. This is the Antenna Tuning Unit for tower 1, which is the reference tower for both the day and night arrays. 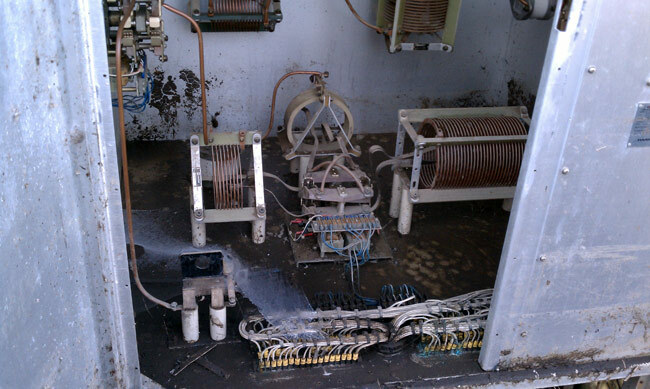 The E.F. Johnson contactor in the bottom of the cabinet was fully submerged for an undetermined amount of time. The bottom of the unit is covered in fine silt. The high water mark is visible on the right side of the aluminum cabinet. The contactor is going to need to be replaced, or at least rebuilt. The ATU cabinet will need to be washed out. There are two other ATUs that suffered the same fate. 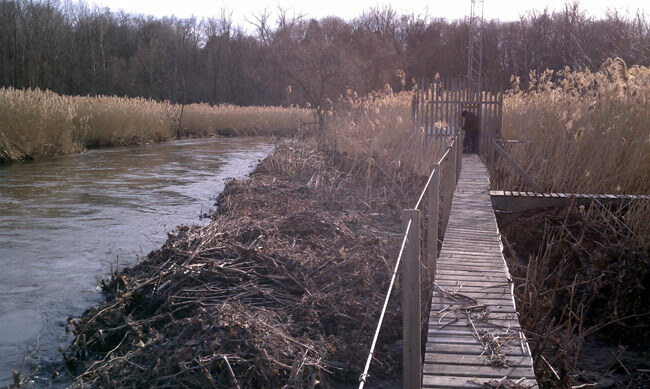 This is the end of the catwalk next to the Peekskill Hollow Creek looking west towards the Hudson River. 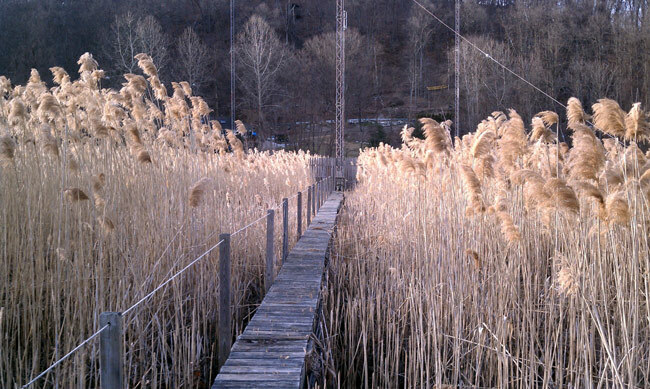 The water level reached the bottom of the catwalks and had receded about 4 feet when this picture was taken. Lookup east, upstream at tower 5. 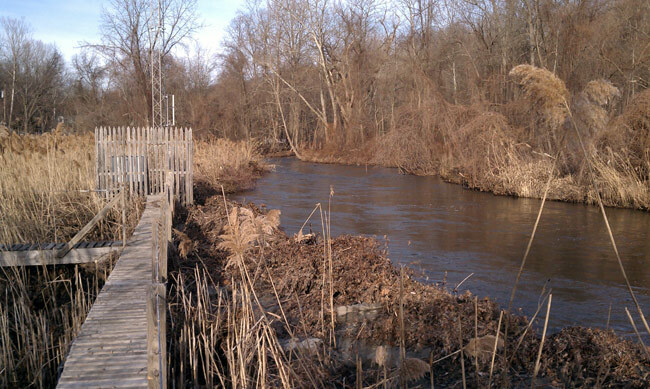 This is the antenna array looking north, with my back facing the creek. Tower one is the center tower, tower two is on the right and tower four is on the left. 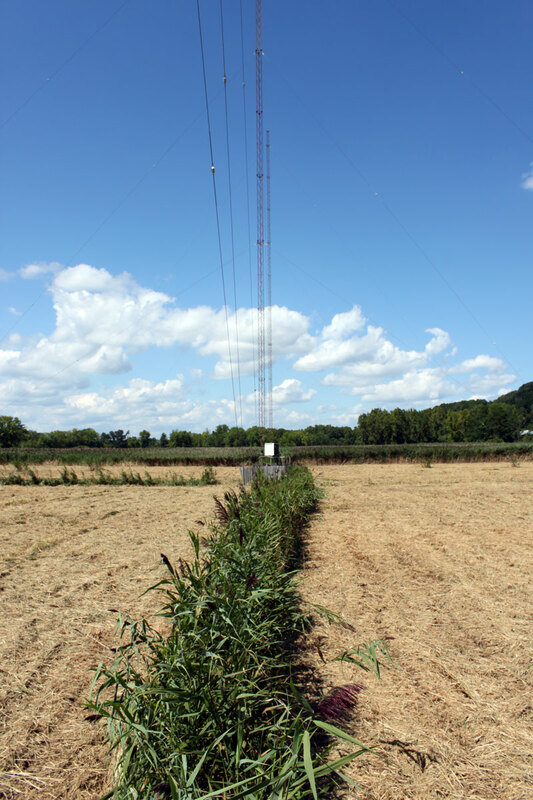 The daytime array consists of towers 1, 2, and 3 bearing 300 degrees. The night time array consists of towers 1, 4, and 5 bearing 335 degrees, so the array makes a big X in the swamp. 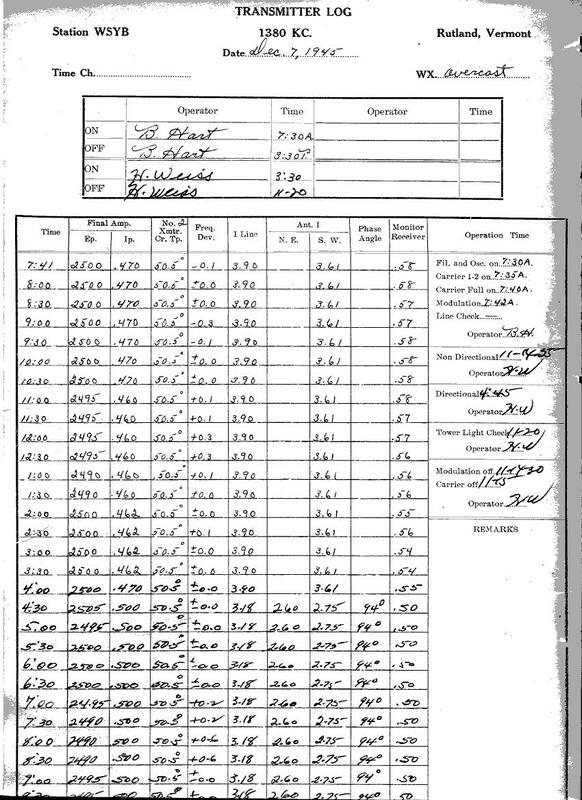 More from the FCC database. What is “Phasing” as it relates to radio? Looks like real good ground conductivity. After in moved from the hill top location (1/2 wave tower, 1KW daytimer) to the swamp (5 KW day/1KW night) it never lived up to expectations. I don’t know if it is because there are other 1420’s and 1430’s nearby, or if the site is not well designed. Frankly, if I owned the station, I’d take it back to 1KW non-directional daytime with whatever PSSA/PSRA I could get. It would be relatively easy, drop the outer four towers, add 20 feet to the center tower and 30 degrees of top loading, making the tower 160 degrees. I would also install an above ground counterpoise. That would probably give that station good local coverage and greatly reduce maintenance and operation costs. I totally agree with you. I’d even raise it a little higher if I could and top load it to 225 degrees effective for a lower base impedance than 1/2 wave. Cut the power, making it 1 kW N-DD, and DA-1N. Savings in electrical power each month would pay for the added tower in no time, and would yield a better groundwave signal. There was a time when non-technical station owners and managers wanted “bragging rights” to boost sales revenue from advertisers and their agencies. It is really a myth. For daytime operation, nothing beats non-directional on any band. The only problem now is what may have occurred with co-channel and adjacent channel stations during the day in the meantime. WLNA may have signed their death warrant and given up their original ND contour because some Johnny Come Lately decided to shoe-horn their contour right against the daytime directional pattern contour. Engineering consultants have always seemed to do whatever the station management wanted, however there was one around here (now deceased) that would actually talk stations out of doing foolish things. With an 300 feet tower on the waves with a 50kW Ampliphase RCA transmitter.